The publisher of the Daily Mail and Mail on Sunday must immediately take down this article and apologise to Ken Livingstone for misquoting him, clearly in the hope of kicking off once again a scandal that in reality is just not there! We hope Ken sues them for libel. We urge all supporters of LAW to complain here to the publisher of the Daily Mail (there is a limit on the amount of words, you could use the template below). And click here to make a formal complaint to IPSO (template below). In your article you charge Ken Livingstone with having stated: “It is not anti-Semitic to hate the Jews of Israel.” You even feature this in the headline. You should take this article down and apologise to Ken Livingstone immediately. The article claims that Ken Livingstone, at a meeting ‘Defend the Left’, said: “It is not anti-Semitic to hate the Jews of Israel.” This is even featured as a stand alone quote as part of the headline. 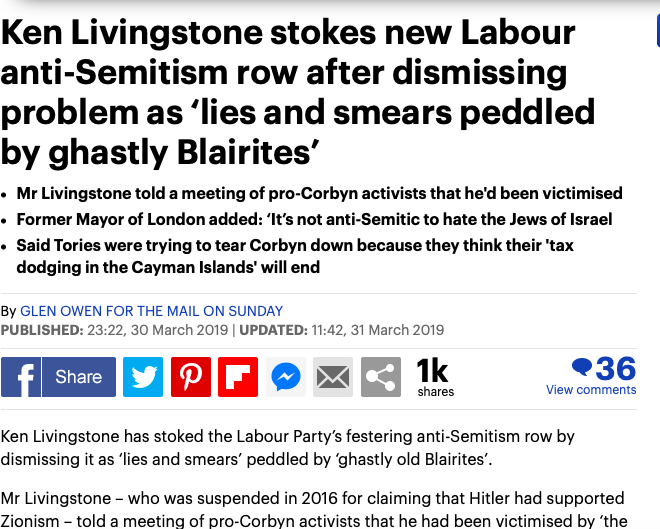 Now if you compare the write-up in the Mail on Sunday with the actual words from the video, I believe it becomes very clear that the Mail on Sunday has quoted Livingstone out of context and maliciously. Clearly, Ken Livingstone was reporting what John Mann MP had accused him of – he ridiculed these charges, because they were so absurd! I believe that this article is an outrageous attempt to smear Ken Livingstone and the organisation Labour Against the Witchhunt, which put on the meeting. I believe the publisher of the Daily Mail and Mail on Sunday must immediately take down this article and apologise to Ken Livingstone and Labour Against the Witchhunt for misquoting him, clearly in the hope of kicking off once again a scandal that in reality is just not there!